The ExaLINK Fusion is a modular network application platform. It has 3 line card bays which can be populated with SFP+ and/or QSFP line card modules. The SFP+ line card module supports 16 SFP+ ports that can run in 1G/10G modes (depending on the active firmware). Up to 3x 16 port SFP+ line card modules can be run in any one ExaLINK Fusion chassis giving up to 48, 10Gb/s ports. The QSFP line card module supports 4 QSFP ports each. The ports can run in 1G/10G/40G modes (depending on the active firmware). 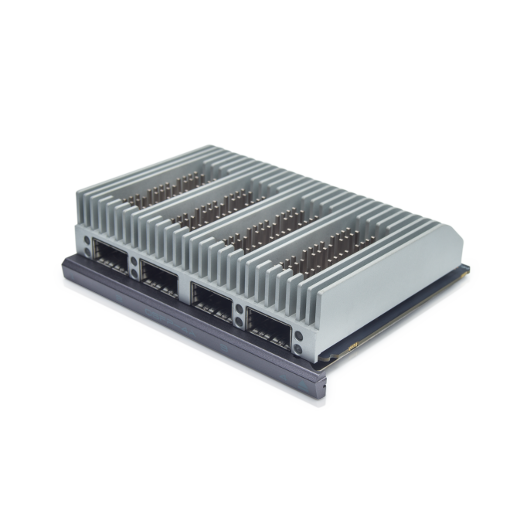 Up to 3x QSFP line card modules can be run in any one ExaLINK Fusion chassis giving up to 48, 10Gb/s ports, distributed over 12 physical connectors. QSFP line cards are especially useful for customers using high density FPGA based NIC devices (e.g. ExaNIC X40, ExaNIC V5P ).